Our review today is about this little known gem by Hollandspiele. 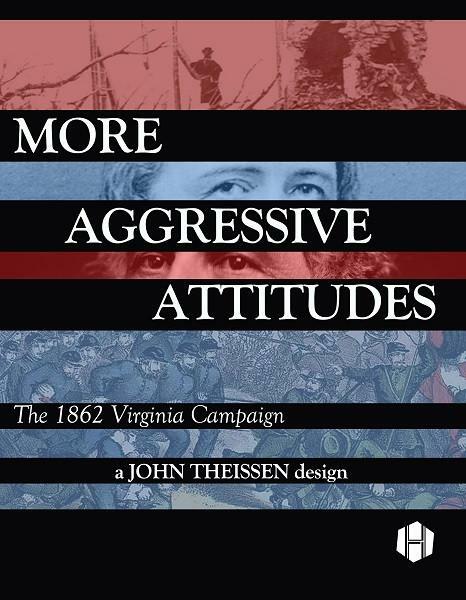 This game is about the 1862 campaign in northern Virginia that climaxed with the Second Battle of Bull Run. It starred John Pope, and a little known general Robert E. Lee. Contrary to his usual stoic behavior, Lee seemed to have a large dislike or even hatred toward this one opponent. Pope had put in place some draconian measures to be used against the southern population and sympathizers. This would be the first step of the total war that the Civil War became. Pope was made famous by his quote that his "headquarters would be in the saddle", which led to the bon mot that his headquarters were where his hindquarters should be. The quote was well intended, but not too thought out. 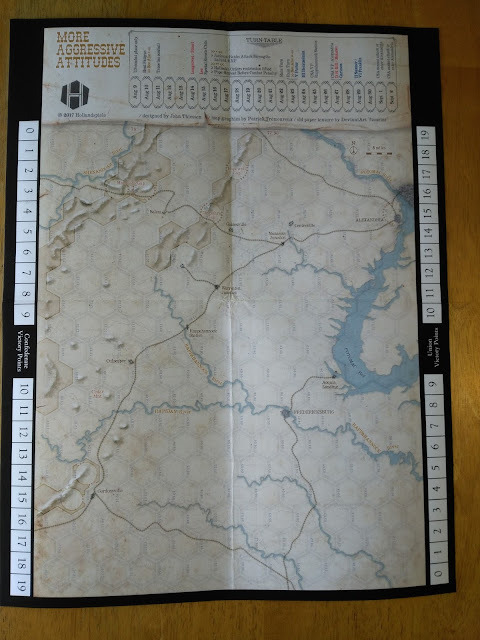 The game map is supposed to be 11" X 17"(my ruler say it is closer to 13"X19"), and there are only 88 counters to worry about. You play the commanding general of either side. One nice touch, and a fly in the soup, is that that the officers below you might or might not follow your orders. So every game that you play even if you use exactly the same strategy will never play out the same. As the Confederate general, you will have to dispose of Pope and his soldiers before too many of "Little Mac's" Federal soldiers from the Peninsula campaign can intervene. As the Federals you can either try to trap and annihilate Jackson before more Confederates show up, or back pedal and fight Lee's Army defensively. The length of the campaign is from August 9th to September 2nd. The game is played in daily turns. The map was produced to look like it is on old paper. There are not many points of interest on it besides some towns, cities, and rivers. However, if you look closely you will see a ton of details and place names. It is just a paper map, so do not do what I did and get too aggressive trying to straighten it out. Mine now has a crumpled portion right at the junction of the folds in the middle of the map. As mentioned, the game comes with 88 counters. These are not elaborately designed, but are fully functional. They are thick counters, and to take them off the sprue is not a hassle at all. The amount of actual troop counters on the map, even when all the forces are present, is minuscule. The counters are of the step variety, meaning that if you lose troops, the counter is flipped or exchanged for another counter. As you can see there are very few units on the board on turn one. To add to the Federals' problems is that Jackson's Confederates must be attacked by Bank's troops on the first turn. Many might see heresy on the Jackson counter. He is given a '2' for attack and a '3' for defense, whilst Longstreet is a '3'. I am not a big fan of 'Tom Fool', and would certainly not have liked him as a teacher. So I really think his counter could have had a variable number with a die roll, just as Pope's is. You have a one in six chance with the some of the Union units that even your good commanders will not attack when ordered, unless they are stacked with Pope. The drawback to that is that the Pope counter is a '1' on a die roll of 1-3, and a '2' with a die roll of 4-6. This puts him at a great disadvantage against Lee (who is a '3'), as it should be. These represent negative shifts on the CRT when pitted against one another. The rules are only five pages long, with designer notes on the sixth. 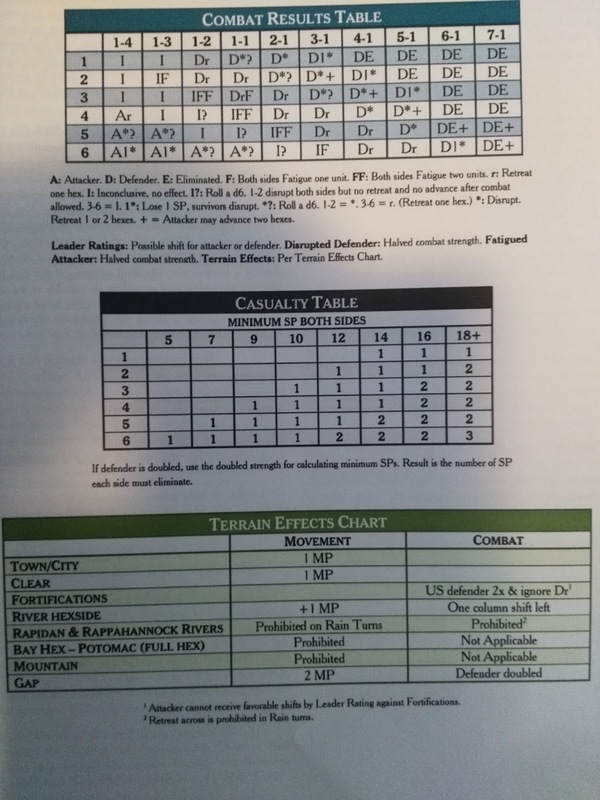 The seventh page is for the CRT, Casualty Table, and the Terrain Effects Chart. The victory conditions are easy to remember. The Federal player only gains points by winning battles and causing casualties. The Confederate player can also do the above, with added victory points for destroying federal depots, and occupying several hexes. Both sides can put into play 'special events chits'. There are also several other rules that add to the game. Infantry units can try to retreat before battle, cavalry and leaders can do so automatically. Jackson does get one rule in his favor: his units can recover from disruption on a die roll of 1-4. All other units have to make a 1-3 roll. Forced march, night march, and other special event chits add to the flavor and immersion. Unlike many games that try to bolster or skew a campaign to make it more gamey, MAA gives the Federal player a rough hand of cards to play. 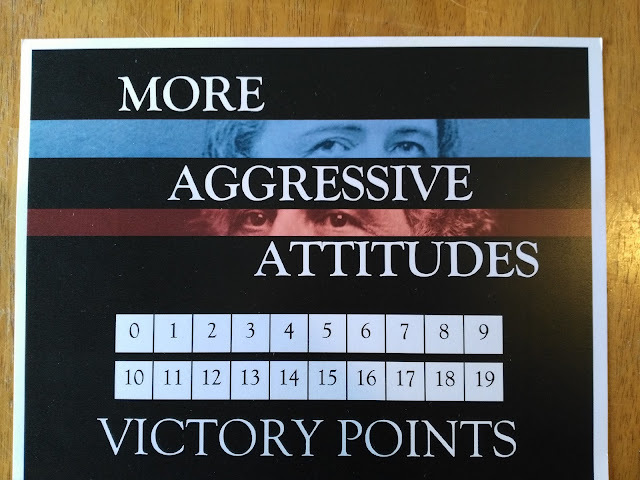 The designer has added some rules/innovations that to me truly help represent 19th century battles. It costs an extra movement point to stack with friendly units. Attack coordination is also not a gimme, you have to roll to see if two or more stacks can add their numbers to the original stack numbers. So a three stack to one attack could quickly become just three separate one to one stack attacks. The nuances in the rules etc. leave the player always thinking, and mulling over the different options he has. In my play- throughs I wouldn't say that the Confederates are a juggernaut fast approaching Pope and his saddle, but some good play as the Federal player is required. You cannot afford to just auto play even one turn. 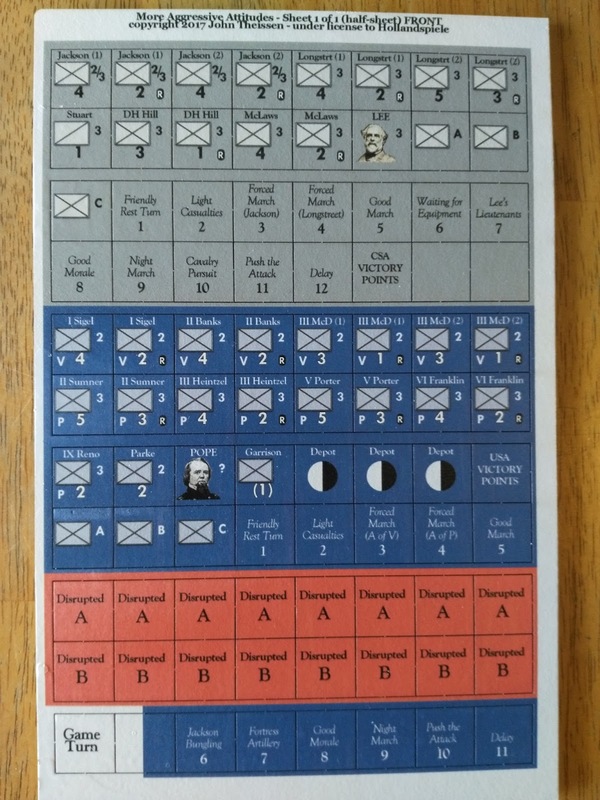 I like the game and can recommend it to anyone who is interested in the campaign. 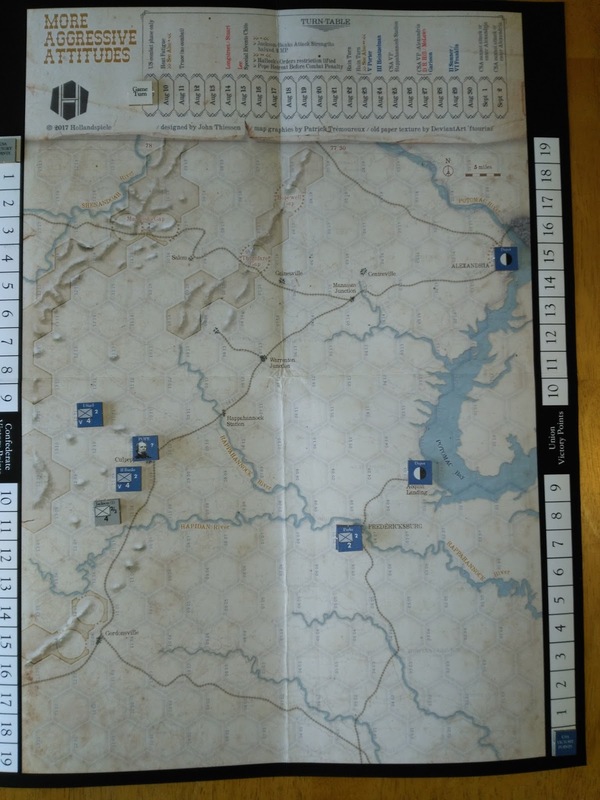 It is not a campaign that has too many games that represent just this small part of the Eastern campaign in 1862. So for that thanks Hollandspiele.
" What to do with a lowly rated leader in wargames? A leader with a poor rating might be historically accurate, but then a game player might not want to use him. 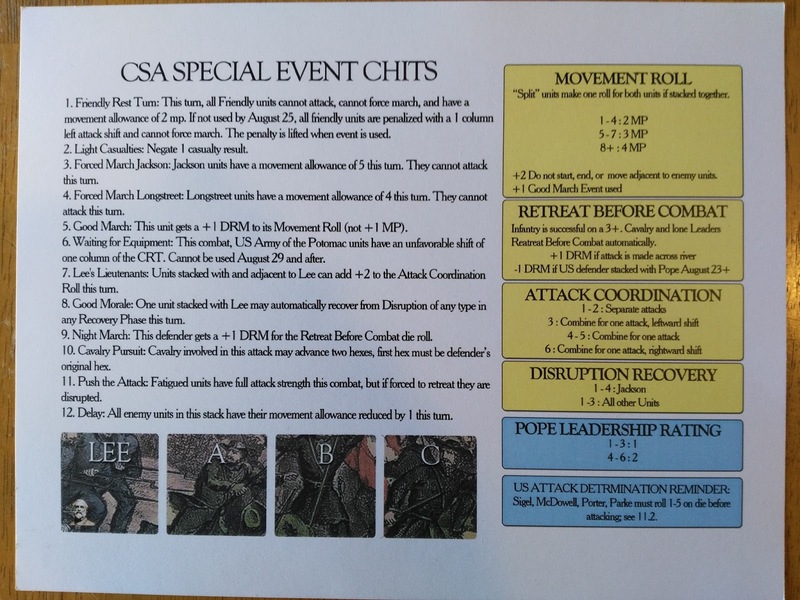 For this game, here are two optional rules that give incentives to use the leader Pope more and get him into the action. If two or more US units (both of McDowell's units in the same hex are considered to be one unit for all purposes in this rule) are stacked in a hex and attempt to attack, they must roll for Attack Coordination. If a 1 or 2 is rolled, at least one US must attack, Union player's choice. After that, the Union player may continue to attack with one unit at a time or cancel any further attacks, at the US player's choice. If a 6 is rolled, the rightward CRT shift is ignored and not used. If the leader Pope is stacked in a hex the above is negated. 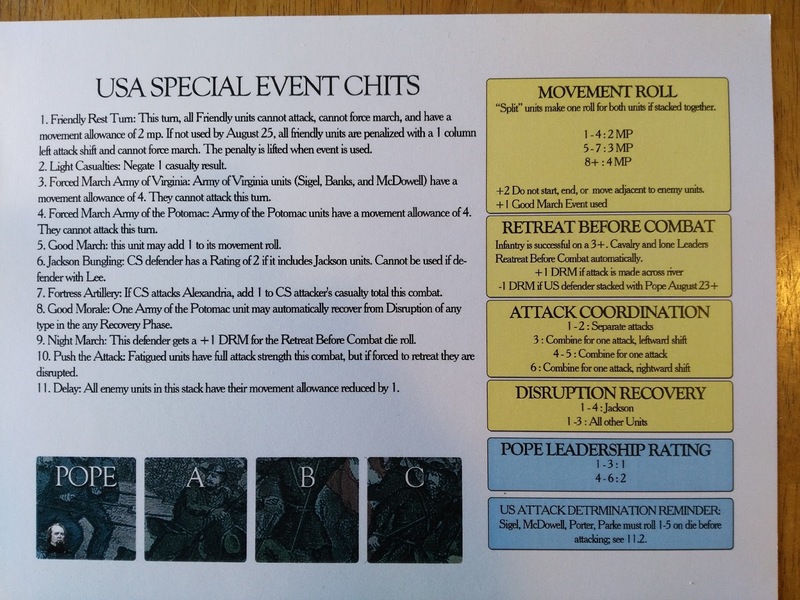 The units stacked with Pope may automatically attack with one combat strength. Roll for Pope's Leadership rating as in the rules when required. Modify the results of a roll of 2-6 so that the indicated rating is used, but instead of the rating negating all others in the hex, that rating is averaged with all other ratings in the hex. Count Pope as one unit for the calculation. Example- Pope is stacked with Union Corps Reno and Sigel, and they participate in a combat. Roll for Pope's leadership. A 3 is rolled. Pope's rating is 1. Now calculate average leadership. 1+3+2 (Pope + Reno + Sigel) = 6 . Divide by 3 (three units) = average leader rating for this battle is 2. If a 1 is rolled for Pope Leadership Rating, his overconfidence and unwillingness to accept intelligence reports give a result as the original rule. That is, the rating for the stack is 1."